The Fencer looms large in California’s southland this winter, filling the air with more than a chill. A Shortlist Nominee for the Best Foreign Language Film in the 2016 Oscars® and a nominee for Best Motion Picture – Foreign Language for the Golden Globes, the film is the Opening Gala at both the Palm Springs International Film Festival (on Jan. 1st at the Camelot Theatres) and the 17th Scandinavian Film Festival Los Angeles, (on Jan. 9th at the Writers Guild of America Theatre in Beverly Hills). 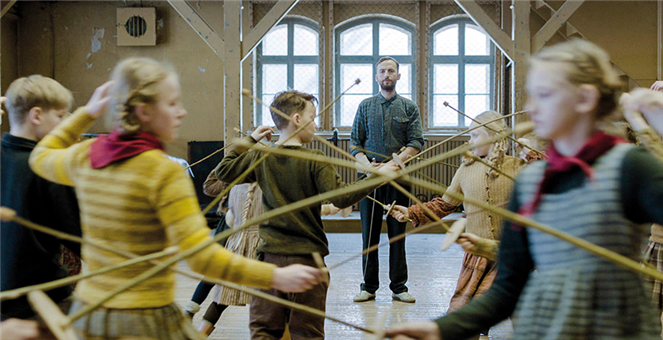 Director Klaus Härö from Finland will be on-hand at both celebrations to welcome visitors to the screenings of his Finnish-Estonian-German co-production based on the true story of a swordsman-turned-teacher in the postwar Soviet occupation of Estonia. 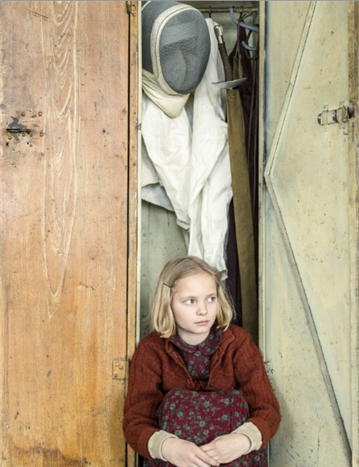 Lauded for his historical dramas made in both Finland and Sweden that often portray the plight of children, Klaus Härö has now made five theatrical features: Elina — As If I Wasn’t There (2002), Mother of Mine (2005), The New Man (2007), Letters to Father Jacob (2009), and The Fencer (2014). Four of the five have been Finland’s official submission to the Academy Awards for Best Foreign Language Film. I met with Klaus Härö in Beverly Hills in the midst of his private screenings for members of the Academy of Motion Pictures Arts and Sciences and the Hollywood Foreign Press Association as well as special screenings by European Film Promotion where he addressed audiences in Q&A post-film discussions. His energy, compassion, and warm-hearted enthusiasm sparked a lively exchange. It’s all about precision and distance in fencing. 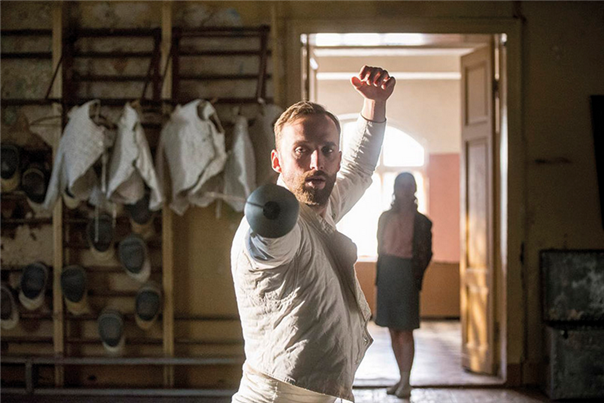 KinoCaviar How did you decide to make a film about fencing? Klaus Härö I’m not a fencer — I never did it in my life. I took two lessons, but my main actor took two months of lessons. 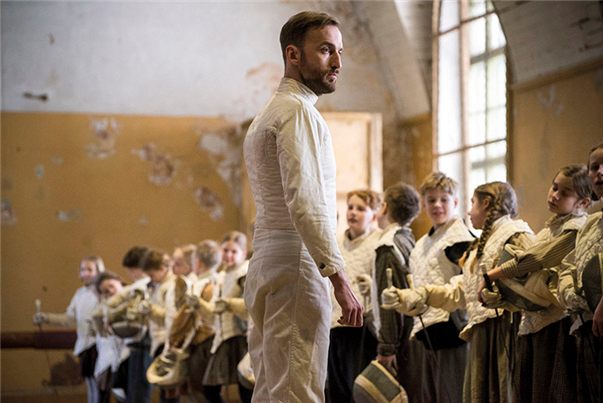 In the fencing club of 20 members, 15 actually went on to become fencers. 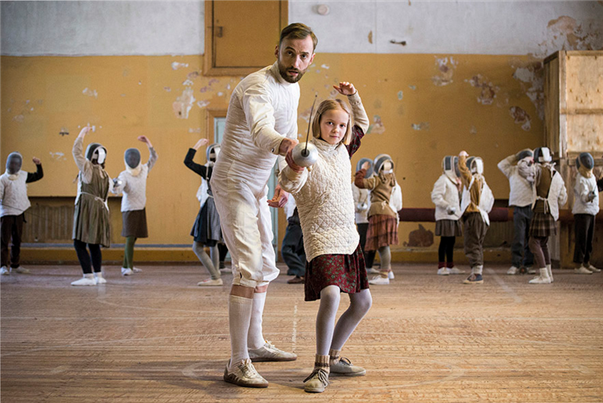 We had 50 kids for the film, but for the 5 main roles, those kids had to really learn fencing. It’s all about precision and distance in fencing. At first when I read the script, about the 1950s under Stalin, it sounded depressing, and I was headed to make a film about today. But by page 15, when the kids started fencing, it caught me and I read on. The writer, Anna Heinämaa, started fencing in her late forties or early fifties, and she knew fencing was about one’s distance, about keeping the other person at bay. She was a novelist, and it was her first screenplay. Yet she understood what telling stories in pictures meant, to be more cinematic than with words — fencing took her there. KC Has fencing been a big sport in the Baltic region? KH In Estonia, with less than 1.5 million people, fencing is really big. The writer met the actual daughter of the real Endel, and you saw his kids in the film — his son, at the end; he became a fencing teacher, and so did his kids’ kids, building a small dynasty. Fencing is… standing straight, face-to-face, being willing to take on someone if you need to — and the ritual, the beauty in the sport. KC So how does fencing relate to Estonia’s history with Russia? KH Late one night in Haapsalu, around 10 or 11 pm, our whole crew was on mobile phones. We were reading the news that Russia had just entered the Ukraine. It was late March or early April. It was like time traveling to see this happening then. Fencing is a metaphor for Estonia’s relation to Russia — that, too — but also of that time of gloominess, in an era of just looking at the floor, down, and not meeting anyone, living your life in hiding versus fencing, the opposite — standing straight, face-to-face, being willing to take on someone if you need to — and the ritual, the beauty in the sport. KC Were many changes made between the screenplay and the actual film? KH Anna’s script was extraordinary, and very ready. We developed it only somewhat. For example, the grandfather role was enhanced and brought to the surface, but only in editing the script, not re-writing it. Anna is a novelist, and she adapted her style to screenwriting. The love scenes were different in the script. We changed them on the spot. Endel (Märt Avandi) teaches Kadri (Ursula Ratasepp) how to fence. We were in Tallinn in a school and Märt was fencing as we were testing the lenses. Ursula went up to him and hiked up her skirt as she got him to show her how to hold her stance — it inspired the scene in the film. I loved the story. I’d go to India or China if I loved the script. Language is not my first consideration. KC What was your approach to portraying the adult couple? KH Film is pictures. In the old days, without CGI, how did they pull it off? Hitchcock would close the door in the love scene. You don’t need to show it. You can cut to the next scene and the audience feels it, imagines it, knows it. KC What was the production process like? KH Within the tight restrictions of our production, we set out to find what freedom we had and see where we could go. The budget was limited, and we shot the film in 39 days, which is not a lot because we had children, which meant we were not allowed to work long hours (but we did, I’m sorry to say), and we had fencing to set up all the time. KC What language did you use during the shooting process? KH I speak Finnish, Swedish, and English, not Russian, so we had no common language with the actors or with the children. We had a translator into Estonian, who went on at length (who had studied to be a director). But the young actors lost the tone and concentration through all of it, so we tortured the English language and used that. The older kids knew it, but the younger ones didn’t. We struggled. I’m more of a coach. It’s always a surprise where the kids will take you. KC Who actually chose the child actors, you or the casting director? KH Kieslowski said it best: “The director who does his job is useless.” So I let them do their jobs and relied on the casting director. 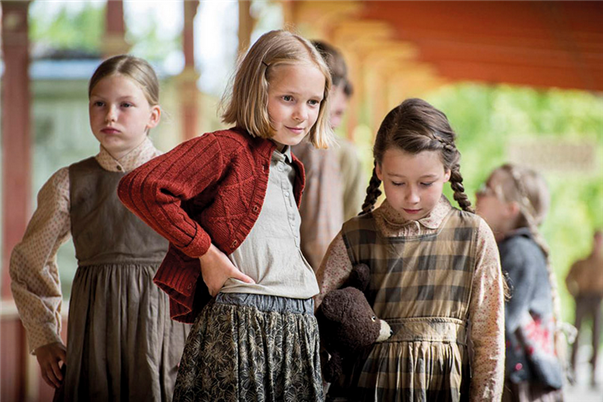 The actress who played Marta, Liisa Koppel, had done one little acting job before, but the other kids, none at all. We had wonderful actors, not fussy ones, who were able to concentrate and respond to whatever the main actor did. them with candy and so on. I’m pretty harsh with kids during a shoot. I’m more of a coach. It’s always a surprise where the kids will take you. I don’t direct them differently from adults. I really rely on the professional actors to cue kids with their faces. KC How did you cast the lead actors? Lembit Ulfsak, who plays the grandfather, is a wonderful Estonian actor, extremely professional. I don’t like to tell actors what to do — just the real basics. If they want to talk lots, I let them. But some don’t. Lembit’s like that, very minimal in his approach with minor discussion. He will never do the same take twice — he couldn’t repeat it — and he’s so exciting to work with. He wasn’t there every day, like Märt. We had a very clear relation, a give and take. He told me that even today in the Baltic, people ask who someone used to be. They don’t trust those around them from the past. I try to burden the film as little as possible with historical facts. KC Did you shoot on location? KH We never went to Russia. It’s all shot in Tallinn. I like repetition and rhythm. You say, ‘I’ve been here, but something’s changed.’ I like the power of suggestion. The main time for shooting the film was spring with a bit of a winter feeling, and then again in summer in July, our holiday, with winter fur coats and hats. It was so hot for the actors! KC Does your film impact the relation between Estonia and Russia today? KH For us Finns, it’s a theoretical question. For Estonians, they gained their independence only in 1991. They’re members of NATO, but in the past, no one helped them. They were invaded by Germany and Russia, but Obama went there and said, ‘We will not abandon you!’ They said, ‘We hope you mean it!’ They are on guard. KC Whose idea was the character of the school Principal? KC Do you consider the film political? KH I don’t consider myself a writer. I have a huge respect for them, and I sometimes work well with them, sometimes not. Anna had been working on the script for years. I’m more cinematic as I create and make any changes. I try to burden the film as little as possible with historical facts. I try to have just a few real characters. I like to keep the film simple, to tell the story emotionally. I’m attracted to characters, not plots. KC Was Endel fleeing the KGB in real life? Why did he change his name? Why did he go to Leningrad? KH Fleeing the KGB? Probably not. Keller was his name when he was drafted by the Nazis. He changed it when he fled to Leningrad after the war because it was a big place, and he could hide. You see that the Estonian fathers in the film have been deported, jailed, or killed. Endel Nelis was his real name, an Estonian name. He had some trouble with the authorities, but we don’t know what. It’s Anna’s work, and she dramatized a bit of Estonian history. In the Soviet period, all you had to do was disagree with someone and you wee in trouble. I never choose politics — but with the dads gone and the moms working, the kids were left to themselves (then and also in our own world). It’s really about this for me. Some dads were drafted by the Germans, but there were some who didn’t die and didn’t flee, who remained after the war, and were deported by the Russians just to establish fear, and therefore power. I had never set foot in Estonia before, even though I was so close. When I was still new there, I looked at the Estonian horizon — so beautiful and so sad you wanted to cry — because all the flags were at half-mast. In 1940 Russia took over Estonia. One night the Russians just came and deported thousands of people for no reason other than to scatter them, so that the Russians could rule better, as in Poland. This is how I wanted the film to feel — like an uninvited guest who breaks in and destroys the beauty. For fifty years Estonians were living in a no-man’s-land. There was beauty, poetry beneath it all, but it was well hidden, and I wanted to let it shine through. KC Would you make a film outside the Baltic region? KH I loved this story. That’s why I made the film. I’d go to India or China if I loved the script. Language is not my first consideration. I started with E.T., not the classics. 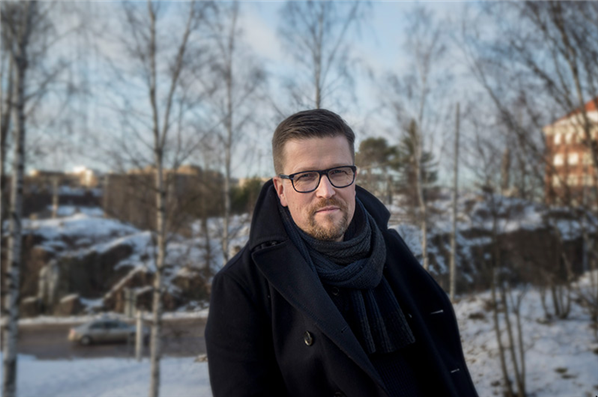 KC What was it like to become a filmmaker in Finland? KH I grew up in Finland, and even Finns didn’t see their own films on their own screens. Still, by the age of twelve or thirteen I wanted to become a filmmaker and to go to film school, but I wasn’t that good. I was a movie buff in a small town of 50,000 people, 35 miles from Helsinki. In theory you could see all foreign films and classics on a VCR, but my dad thought we didn’t need one. I started with E.T., not the classics. It blew my mind. Eventually I could see John Ford or Hitchcock on TV, but I had to wait a year or two to see Forman’s One Flew Over the Cuckoo’s Nest or Peter Sellers in Hal Ashby’s Being There. I hid a tape recorder under my jacket and taped the soundtrack so that I could re-experience the films. At my school I studied directing and writing, but it wasn’t the best for me. It was very theoretical, not hands-on. We studied the classics. In Finland at first, my training on the set was lacking, so I took lots of odd jobs in film and went back to film school then and made lots of shorts. I earned a master’s from the Dept. of Film, TV, and Scenography at the University of Art and Design Helsinki. I went to Sweden to make my first film because the stories and scripts came from Sweden, beginning with Elina. Sweden felt children’s films (or films with children) were very ambitious, big projects, and the Swedes were uncompromising regarding quality and casting. This was unheard of in Finland. So many filmmakers in Finland made one film and no more. I got lots of support in the end — Swedish films and co-productions helped me. Elina and The New Man were made in Swedish. Mother of Mine was made in Finland. The best films today are American, where you’re able to combine simple storytelling with some experiences that are unique. KC You’re known for the lyrical beauty of your images. The lighting of the bin of hay in the scene when the equipment arrives at the school leaves quite an impression. It struck me as a warm halo on elated baby chicks hopping around in a cozy nest. KH That scene was really different because we didn’t have any back-up to re-pack it all for a second or third take. The boxes kept falling apart because the kids kept hanging on them; the kids were getting tired because the scene was so physical. I saw these two boxes in this dark hall, but what didn’t come to me was my lack of training in working with actors. I rely on actors a lot, because they get good ideas, but with kids, I have to show them a lot. Tuomo Hutri (the Director of Photography) and I spoke the same language since day one — we worked on Letters to Father Jacob together. My first three films all had the same Director of Photography, too, but a different one. KC Who are your biggest artistic influences? KH I’m influenced by Scandinavian and American classics, not so much by European films. You might say my works have a Scandinavian feel to them, but I hope with a clearly defined story that has a beginning, a middle, and an end. I’d be utterly bored by films that are too experimental. The best films today are American, where you’re able to combine simple storytelling with some experiences that are unique. Last year’s Estonian co-production, Tangerines (nominated for the Best Foreign Language Film Oscar) was a simple story with poetry — with both beauty and brutality in the same film. KC Well I notice that your Co-Producer from Estonia for The Fencer, Ivo Felt, is the same one who co-produced Tangerines, and now you are short-listed for the “Oscars” and nominated the “Globes”— so best of luck! Director: Klaus Härö; Producers: Kai Nordberg, Kaarle Aho, Ivo Felt, Jorg Bundschuh; Screenwriter: Anna Heinamaa; Editors: Tambet Tasuja, Ueli Christen; Cinematographer: Tuomo Hutri; Production Designer: Jaagup Roomet; Costume Designer: Tiina Kaukanen; Music: Gert Wilden Jr. Cast: Märt Avandi, Liisa Koppel, Joonas Koff, Ursula Ratasepp, Lembit Ulfsak, Hendrik Toompere, Kirill Käro, Kai Nordberg, Kaarle Aho. Color, 99 min. In Estonian and Russian with English subtitles.